Behind every bestseller stands a discerning editor, just as behind every delicious meal stirs an exacting cook. So one can only surmise that behind every successful cookbook is an editor who wields pen and paring knife with equal skill. 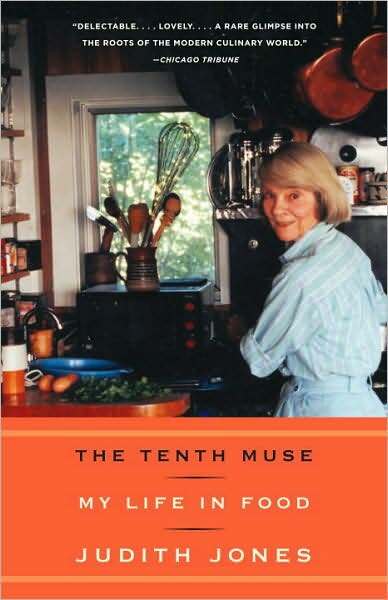 Judith Jones proves she is a master of both in her memoir The Tenth Muse: My Life in Food. The buds of these twin talents first emerged in 1948Paris, where a young Jones was tasting life beyond the strictures of her Vermont upbringing. (Garlic, for example, was considered by her mother “alien and vulgar.”) On a whim, her summer holiday became a three-year stay full of romantic charm: shopping in open-air markets, securing a job in publishing, learning French, and marrying Evan Jones, her former boss. Eventually the Joneses resettled in New York where they strove to maintain their European palates despite the limited offerings of supermarkets. (This was at a time when many American recipes required a can opener and emphasized speed.) But a sea change was occurring in American kitchens. More people were traveling abroad, discovering new tastes, and wanting to re-create these meals at home. As gastronomy caught on in the US, cookbooks began to appear on Jones’s editing desk at Knopf, including “a huge manuscript on French cooking” by three unknown women. One of those women turned out to be Julia Child and the manuscript became “Mastering the Art of French Cooking.” Scores of other partnerships with cooks and chefs followed as Jones helped to establish Edna Lewis, Marion Cunningham, and James Beard, along with many others, as household names. Longstanding cookbooks with a mishmash of European influences experienced new clarity under Jones’s pen as she sought out cooks who knew how to add flavor to a dish using fresh, local ingredients. Pages of Jell-O recipes disappeared. With Jones as a guide, cooking becomes a religious act to share with others or experience alone. Her adventure begins as a young woman at a table for one in Paris and concludes advocating that singles (Jones is now a widow) should persist in the luxury of preparing and enjoying a good meal. Throughout, her tone is expert, casual, as if one is listening to a story at her table after a satisfying meal. She shares recipes and tips from her mentors and encourages all to improvise. It’s an invitation into the kitchen that’s hard to resist. This review first appeared in The Christian Science Monitor.